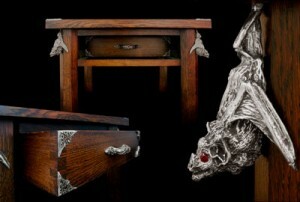 Sculptor Paul Allinson creates custom jewelry, shoes, and furniture with wonderful gothic detailing. I’m enormously taken with the little bats clinging to this desk, but all of his work is really striking: Check out the heels of these boots and this awesome walking cane. The prices for many items aren’t listed, but the jewelry at least seems fairly affordable. He also does custom work, including big dramatic pendants and unusual items like petrol caps.